I have been a huge proponent of computer workshops and camps for children, so I was thrilled to hear that Apple has announced that it will be offering holiday-themed workshops for children ages six to 13-years-old during the holiday season at select stores. The workshop will focus on photos, videos and presentations all implementing Apple’s iLife and iWork software and last anywhere from 60 to 90 minutes. Unfortunately, only twelve stores are participating in nine states and shockingly California is not one of them. How can Apple, whom focuses on the State of California to the point of printing “Designed in California” on their packaging not have one of these workshops in the second largest state in the country? Not to say other states are undeserving, but when you look at the full list here, states like Iowa and New Hampshire which have one and two stores respectively are participating in the program. Each store has a different set of worshops so make sure you check each location to sign up for specific holiday workshops. Maybe this is a pilot program or a test run, as it seems a bit odd implementing this, what would seem like a highly desirable workshop in less populated areas as well as highly populated areas such as the New York City Upper West Side Store. This brings me to to my next curiosity about kids and computers. My daughter is now 8 years old and for the last few years I have been looking for computer camps to occupy, at least some of her time during school breaks and summer vacation. 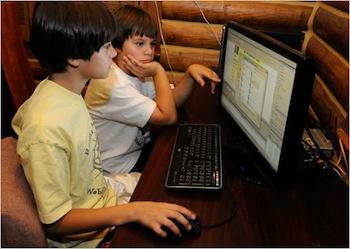 You would think living a mere hour from Silicone Valley that these types of computer camps would be plentiful and our communities would want to teach children basic computer skills at a young age, but none exist here in the Central Valley. In fact, there are only a handful that I could find in the San Francisco Bay Area. Keep in mind I am not talking about advanced computing, I have been looking for a program to teach her basic knowledge and skills such as basic vocabulary and how a computer works. You know, What is a peripheral? What is an operating system? What is a program? How to download and install a program, basic typing skills, that kind of stuff. All the stuff I wish I had learned in fourth grade. None, not one offered by either a community department such as parks and recreation, the local colleges or any for profit corporation. You would think this would have some money making potential as what parent doesn’t want their kid to get a head start in the computer realm? Not to mention the fact that kids are very inquisitive and experimenting with what they can do on a computer at increasingly young ages. Heck, my daughter and her friends have been accessing educational websites since they were four or five years old. So my questions to the loyal readers of Techno Buffalo: Are there any programs whatsoever that offer t teach your children about computers? And these programs can be fee based also as most of us don’t mind paying for a service provided. Have you tried to find anything like this for your kids to further their computer skills? In general I want to know your thoughts on the subject. Finally, if you do have the opportunity to send your kids to an Apple Holiday workshop let us know how it was.